Roger Federer was up 5-3 in the fifth set with two match points. 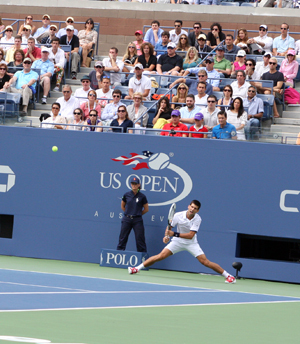 An ace or winner by Roger Federer would send him to the US Open, giving him a chance to win his sixth US Open Title. Novak Djokovic had a different ending to the match. Djokovic fought off both break points, first with an amazing forehand that led him to urge the crowd to cheer him on, and Federer never won another game in the match, as Djokovic closed out the match 6-7, 4-6, 6-3, 6-2, 7-5. With Sean “Diddy” Combs rooting him on from his box with his family, and with numerous stars in attendance, including recording artist Justin Timberlake, actor Michael Douglass, actress Catherine Zeta-Jones, actor Jeremy Piven, and many more, Djokovic, along with Federer, treated the crowd of 24,071 at Arthur Ashe Stadium to a nearly four-hour duel that will not leave the memory of tennis fans any time soon. When asked about facing either Rafael Nadal or Andy Murray in Monday’s US Open Men’s Final and what he needs to do to win, Djokovic responded “Just try to play my game. I know that I have a game that is good enough to win. I need to go on the court believing I can win.” Djokovic certainly believed he could win today, and, against arguably the greatest tennis player of all time, down two match points, he believed, and he won. Wow, great match, but a really tough loss for Roger, especially after losing a 2-0 set lead twice in Grand Slams this year.